Plans for the South Oxford Science Village, a mixed community of high tech business space, around 3,000 homes, schools and infrastructure on the southern border of Oxford, received a boost in November 2017 when the National Infrastructure Commission report on the Oxford – Milton Keynes – Cambridge Arc (Partnering for Prosperity) recommended the re-opening of the Cowley Branch Line to passenger services by 2019. This proposal was echoed by the Chancellor of the Exchequer in his Autumn Budget Statement in 2017. 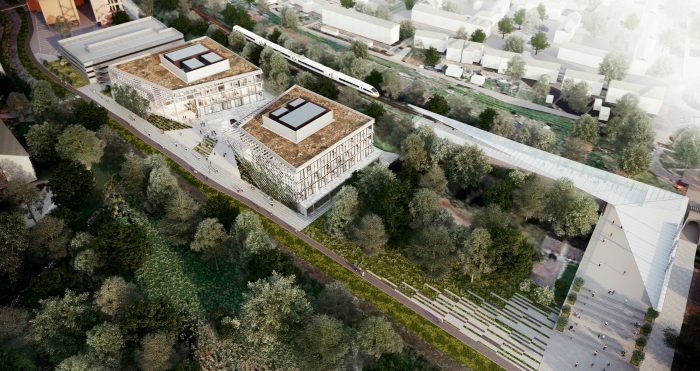 That plan has now been endorsed by the Oxfordshire Growth Board and, this week, The Oxford Science Park has released conceptual sketches of how a new station could fit into its own plans for development. Magdalen College, which owns The Oxford Science Park, is one of the partners in the planned South Oxford Science Village development. The Science Village is one of a number of proposals to alleviate the acute shortage of housing in Oxfordshire, particularly in Oxford itself, but is ideally situated to benefit from the proposed re-opening of the Cowley Branch Line to passenger services. Delivering housing with direct access to the rail network and within easy walking and cycling distance of key employments sites will also help to address pressure on Oxford’s road infrastructure. “South Oxford Science Village offers a unique opportunity to create a vibrant new community, with affordable new homes where they are most needed: adjacent to public transport, with easy access to the existing road network and close to where people work. Re-opening the Cowley Branch Line to passengers makes it an even more compelling proposition. “We have been working with leading architects on options for a major expansion at The Oxford Science Park, which we need to meet the rapidly-growing demand for high quality office and laboratory space. Part of their brief was to develop some imaginative ideas for a new station at the Park which would serve the wider community and integrate the Science Village into the ambitious plans for the Oxford-to-Cambridge knowledge corridor.